Decisions that you make when you are remodelling your home will last a number of years. It is imperative that you make informed choices that will increase the value of your home in the long run. Our consultants will discuss your remodeling with you and talk to you about the best choices that will be the greatest investment. Remodels can be expensive, so it is very important that you get the right cabinetry, appliances and flooring. You and your family want to use the right materials that will be durable and will still look amazing after years of use. 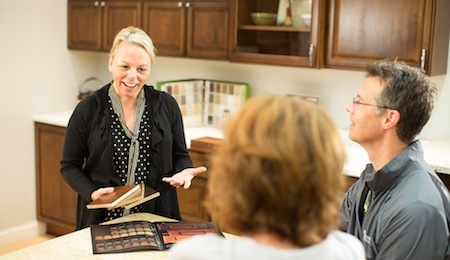 Our consultants will always be there to answer any questions that you may have about your remodel. We are knowledgeable and experienced when it comes to any kind of home or kitchen remodel. We know that every family wants different things when it comes to remodelling their homes. We listen to all of the things that are really important to the family and can advise them on the best choices for their homes. Home remodels can lead to quite a bit of redesign. Our remodeling consultants and contractors will look at your home and its blueprints and will find the right design that will meet the needs of the family and look fantastic. We are always ready to answer any questions that you may have. Our consultants know how to clearly explain everything to our clients. When you are planning on doing a remodel, consult Lampert Lumber first.